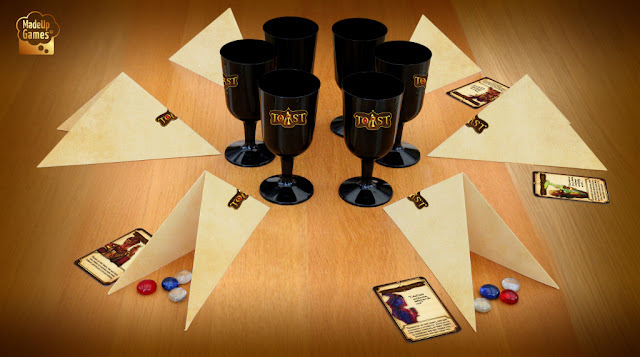 Update: Toast is now being published by Cool Mini or Not and Horrible games as Raise Your Goblets. Original article: Cheers. Good health. Skol. Iechyd da. Every language has the Toast, when you raise your glass, wish someone the best and drink your beverage. But what if you don't actually wish good health on the drinker, what if you want the drinker to die? Then the best option of course is to slip some poison into your enemy's cup. The problem is someone else will no doubt be looking to poison you, so you best keep an eye on which cup has the poison, and which has the antidote. Is it me, or does this wine taste faintly of almonds? In Toast, you are taking part in a royal banquet full of back stabbing evil socialites and everyone wants someone dead. You have until the toast is announced to ensure your goblet has the antidote and your enemy's has the poison. It's a simple blend of three-card monte and social deduction games like Werewolf and The Resistance. You will each be furnished with a goblet, already randomly seeded with wine, poison or antidote, each taking the form of a coloured gem. Players will move goblets, add more gems from their reserve to a goblet, or check the bouquet of their drink, allowing them a sneak peek at their goblet's contents. Once a player has ran out of drink gems they can announce a toast to the King, at which point each player reveals the contents of their goblet, and if the number of poison gems outnumber the antidote gems then that player is dead. Victory points are awarded for surviving and eliminating your target. It's a chaotic blend of bluffing, guesswork and careful positioning of the goblets. Keeping track of what is in which glass is difficult and this is where the game either wins or fails for you. For me it was created the tension, only managing to gain knowledge of one or two glasses and taking a gamble with the rest, trying my best to ensure I had the glass full of antidote and hoping it stays there until someone announces the toast. To me it's a great blend of poker face bluffing and keeping a careful eye on a particular goblet, but some of my players found that game frustrating, they couldn't keep track of what was in each goblet and found the result too random. Toast also comes with a set of characters, each with their own special ability. Count Hellebore has a super poison that cannot be countered with an antidote. Lady Hemlock can check the bouquet of any glass. These characters add an extra level of strategy to the game, but are not necessary to play. Some of the characters end up being a bit complicated, for example the Duke Aconite can announce star crossed lovers and gains extra points if his partner and him die in the same round. For players who are already struggling keeping tabs on the contents of each glass, these abilities can take the game too far into the frustrating side. Toast works perfectly well without these extra characters, and in some games better, so if you find them too powerful or unbalanced you can simply ignore them. Personally I love Toast. It may fry your noodle sometimes as you try and keep an eye on that poisoned goblet moving constantly round the table. Sometimes is does feel too random but that's just because there's a lot of information to consider if you want to ensure victory. It's when you sit round the table with a group of truly evil bastards that Toast really shines. You'll be getting into the role play of it, winking to your fellow guests, happily topping up their drinks, carefully manoeuvring the goblets and smiling evilly at your target while you toast to his good health. Cheers!